Every little princess deserves a hair accessory made just for her. I offer a wide range of hair accessories that are hand crafted with love. Everything is made as though my own daughters will wear them. 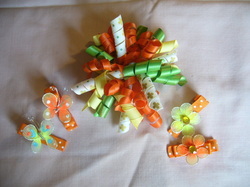 For this reason, I offer you the special opportunity to customize any of our clippies and bows. This personalized service will ensure you that you get the perfect item every time! I make each clip by hand and pay close attention to every detail. I only use the highest quality ribbon and all of my ribbon is heat sealed at the ends to prevent fraying. All clips are lined with no slip grips to ensure they will stay in your princess's hair. Please contact me with any questions or concerns that you may have. I will be happy to get back to you as soon as possible. Now 3 ways to shop! Visit our Face Book fan page!